Focused on player development and want to take your club and its players to another level? Welcome the best coaches of Football Manager 2019 that will help to develop your promising talents into future stars, get your squad ready for match day and increase the tactical familiarity of players’ roles and the overall tactical vision you’ve incorporated for your squad. We’ve earlier talked about the importance of setting up a 5 star coaching team, so today we hand you our list of the best Football Manager 2019 coaches. Considered as the ultimate staff recommendation for Football Manager 2019, our list of the best coaches of FM19 will also feature a backroom staff search filter and a shortlist which you can download and import into your own save. Our massive list of the best coaches of Football Manager 2019 is sorted according to their job role, either they are best suited for coaching goalkeepers, the defensive or attacking aspects of the game relating to tactical, technical or possession, or are best suited to improve players’ strength or quickness. Quickly find the best coaches of Football Manager 2019 as we reveal 5 star coaching staff that improves player development! Considered (by myself at least) to be the most essential task when starting a new save, the hunt for the best coaches and backroom staff kicks off as soon as I’ve gathered an overview of the current coaching team. I myself can spend ‘hours’ scouring through the database for coaching staff which provides the highest coach ratings in each training area (e.g. goalkeeping, defending, attacking, possession and fitness). Here you’ll profit from all the hours I’ve spend looking for the best coaches of Football Manager 2019 as I reveal most of them. While we’ve limited the list to the best ones, our shortlist of the best FM19 coaches and the backroom staff search filter (available to download below) can assist you further – something that’s recommended for all of you who manage in the lower leagues. The list of Football Manager 2019 best coaches features hundreds of coaching staff, from general coaches with expertise in technical or tactical areas of the game, goalkeeping coaches to fitness coaches. The coaching staff featured within this list are sorted by their best training category, star rating and age – from the youngest to the oldest. In situations where staff has the same star rating and age, they will be sorted according to their personality. The coaches star rating, hereby meaning their level of coaching, will influence on the players training progress and are one of the answers to a successful player development – developing a promising talent into a Football Manager wonderkid. These coaches should be targeted to improve the level of training, hereby the development of the players, while reducing the workload of the specific training aspect, which further improves the quality of training. Our list of the best Football Manager 2019 coaches will feature experts of the tactical side of the game; being able to improve players positioning, concentration and decisions, experts of the attacking or defending phase as well as specialists who will focus on players fitness or goalkeepers ability to shot stopping, handling and distribution. 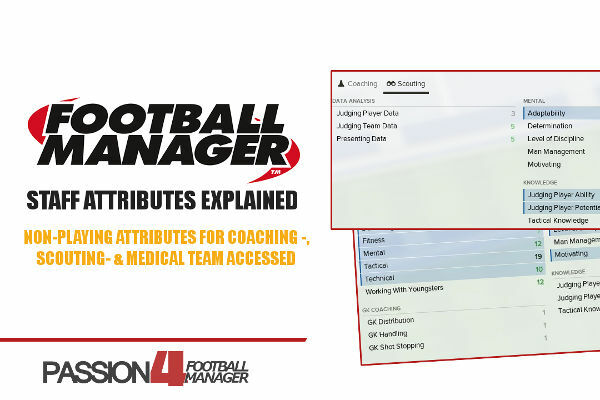 By properly addressing the task of putting together a 5 star coaching team you will not only make sure each staff member can make a greater impact by having more time available to improve specific attributes, but also tailor the player attributes to suit your football philosophy; meaning that every backroom staff appointed will be a valuable piece to get your squad play the game you visualize is the best. The best coaches of Football Manager 2019 will all be professional staff with great personality and an higher degree of coaching qualification. Some of them will have a great reputation which may further improve players training happiness, while others will be more capable of improving players mental state of mind. By appointing a team of entrusted coaching staff you will be one step closer to establish a football philosophy and an overall vision for your new club, either it’s to improve the clubs level of professionalism or take advantage of the 5 star coaching team to develop better players and get the most out of your young talents. These excellent technical or tactical coaches, fitness and goalkeeping coaches will be best suited to work with the occurring development of the players. Apart from assisting you at the training ground at a daily basis they will provide you with valuable feedback of the team’s progress and development of individual players and might become one of the most entrusted staff in your coaching team. You can read more about how to find the best coaches in Football Manager and why assembling a 5 star coaching team is profitable in our guide to finding the best coaches. NOTE! 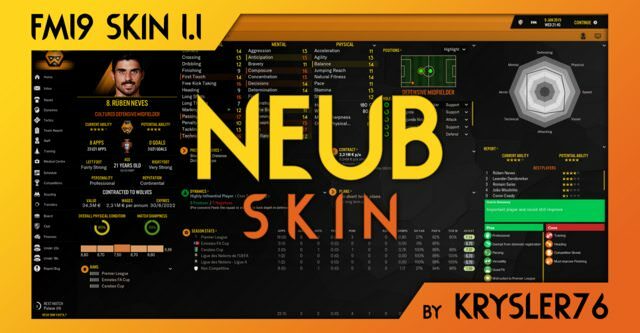 Despite the improvement made to training for Football Manager 2019, I’ve decided to not split up the lists according to the best attacking tactical coaches nor the best possession technical coaches. Instead they’re sorted according to the general training categories. I recommend you to look closely at each staffs best coaching category depending on whether their star ratings will be highest in technical or tactical areas (or both). 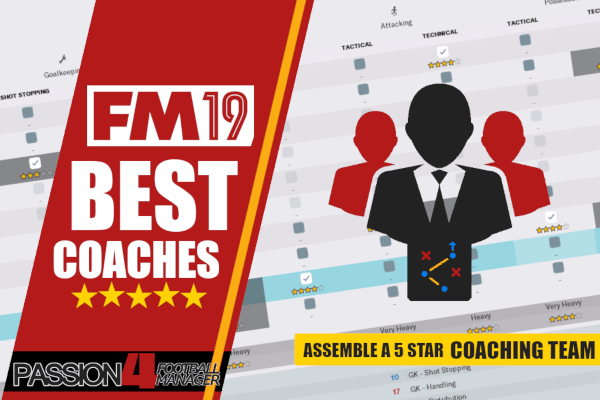 Quickly find the best coaches of Football Manager 2019 with Passion4FMs shortlist of best backroom staff. Features excellent fitness coaches, goalkeeping coaches and general coaches best suited to handle defensive, attacking or possession areas of the game. A comprehensive backroom staff search filter containing the key attributes for all staff roles in Football Manager 2019. Easily keep track on the 5 star coaching staff within your own save (especially handy if your save is filled with ‘only’ newgen staff)! This search filter of the backroom staff can be loaded into every save with only one click. 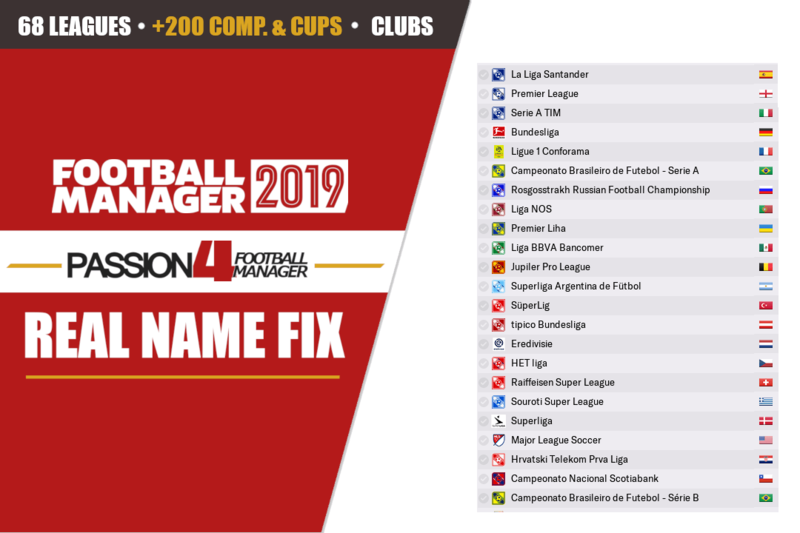 Passion4FM’s recommendation of the best Football Manager 2019 Coaches is work in progress, and will be updated for your benefit until the release of Football Manager 2020. Please use the comment field below to recommend your favorite FM19 coaches.